(un)choir turns the tables on traditional choir. No auditions, no rehearsals, no long-term commitment – just show up and sing a song you love! 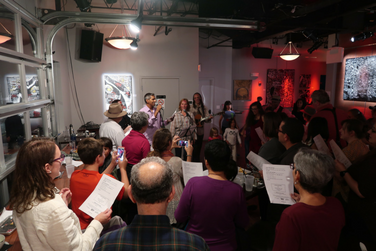 You’ll get a lyric sheet and then Allison Hughes, music director for the College Park Chorale, will teach you 2 or 3 part harmony to a well-known song. The evening will end with a performance by the whole group. There is no cost to participate. Food & beverage will be available to purchase from MilkBoy ArtHouse's menu. 17 hours 1 min ago.